Bear can help us to go within for answers we seek when looking for strength and wisdom. You should understand the basics of Reiki and visualization to use this system. It can be used in the same way as regular Reiki, on its own or in combination with other healing systems. 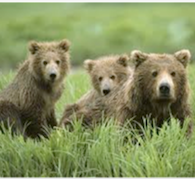 You will be able to visualize a particular kind of bear or use one of the Bear ‘symbols’ included in the attunement. You may already have a Bear Totem or receive one during the attunement. You can also meditate afterwards and ask to receive a Guide Bear or Celestial Bear.